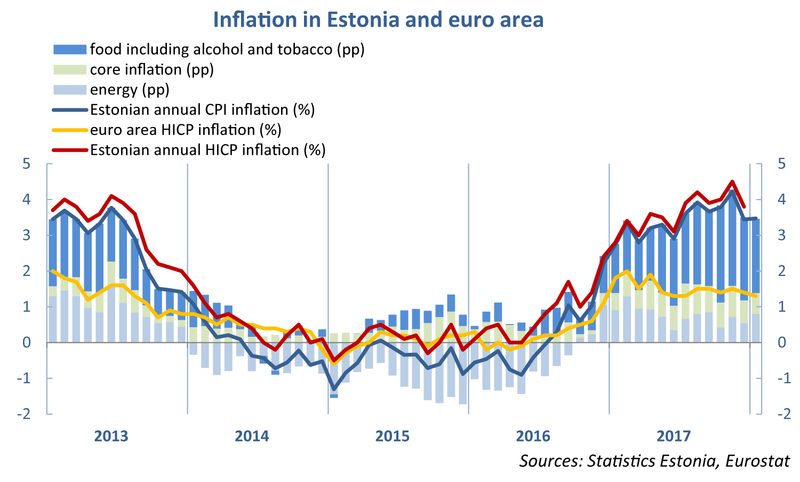 Data from Statistics Estonia show that yearly consumer price inflation was 3.5% in January. The main reason prices rose from December was that energy, including motor fuel and electricity, was more expensive. Prices were up for motor fuels by 4.1% over the month as the higher oil price combined with the introduction of higher excise rates for petrol. Without the impact of higher excise rates, inflation would have been 2.6% in January. Among food products, alcohol saw prices up on the previous month as the promotional prices of December were ended. Prices fell again for butter and some dairy products though. The price of crude oil has been steadily climbing on world markets since the middle of last year. The price of oil in US dollars was 26% higher in January this year than in January 2017. At the same time the euro has strengthened by 15% against the US dollar, offsetting about half of the rise in the oil price. The stronger euro also makes some other food products and imported goods cheaper, as 80% of fuels, 19% of machinery and equipment, and 17% of clothing are imported in US dollars. Changes in the exchange rate affect energy prices directly, but changes in the prices of manufactured goods depend to a large extent on the mark-ups of local companies. As Estonia mainly trades with euro area countries, the nominal effective exchange rate (NEER) for Estonia strengthened by around 4% over the year. Both the inflation perceptions and expectations of consumers have continued to advance in recent months. The increase of inflation perceptions may be explained by rises in the prices of essential goods, which are felt more strongly, and rises in excise. Core inflation, which is the rise in the prices of services and industrial goods, has so far been quite restrained, and was only 1% over the year. Eesti Pank forecasts inflation in 2018 will be 3.2%. Inflation fell in the euro area to 1.3% in January and the European Central Bank forecasts that consumer prices in the euro area will rise by 1.4% this year.